Welcome to "Laurie Here - Contemporary Fiction and MORE - Book Reviews"! Join me and let's escape life into the wonderful world of books getting lost between the covers where the lives of the characters live and their amazing stories take place for a little while! Let's learn about the authors, too! I write "honest" book reviews about my experiences and tell you how the trip was! You may want to follow along with me, too! Leave a comment while you're here, too! Book Review Archive - Find ANY book I've reviewed HERE! Blogs I Follow - Please tell me if you're not here! Happy Sunday! Welcome! To another week of Best Selling books according to the NYT! Posted by NOON every Sunday and sometimes earlier! Well, you know that! I put up the NEW photo I am using every week now! HOPE you like it! I do! It's SO colorful! What's NEW at the blog? Giveaways! This week watch for NEW REVIEWS coming up! I have SO MANY TO WRITE!! I will also be doing a sort of show n' tell about the books I get this week! I was approached by several authors and publishers this week, so a SLEW of NEW books/ebooks will be headed this way! I'm excited to share them with you!!! How was your reading this week? Anything GREAT out there you NEED to share with us in the COMMENTS section? We would LOVE to hear about them! Do YOU have a Giveaway going on? Is there a GREAT book YOU are reading and want to share it with us? PLEASE leave a COMMENT below and tell us! Thanks!! Can't wait to hear about it! Okay! On to the books! FICTION - COMBINED EBOOK AND PRINT! All books are linked to the ebook by the TITLE AND THE PHOTO to Amazon for your convenience! If there is a different format of book you prefer, there is a grey box at Amazon where you can choose which book format you prefer. Just click on it when you get there! I link to the ebook because Amazon changed the linking procedures, and linking to the ebook is much faster and easier this way. Thanks! Have a GREAT week of reading! I don't see a print version available YET. Enjoy this upcoming week! Don't forget - share with us what YOU ARE READING in the Comments! Thanks!! I LOVE Comments so please leave one! After I review the comments and make sure they are NOT SPAM - I HAVE BEEN BOMBARDED WITH SPAM - YOUR COMMENTS WILL BE PUBLISHED HERE! Thanks SO MUCH for your patience and for leaving a comment!!! Comments are ALWAYS welcomed, YET THEY WILL NOT LINK TO GOOGLE+ EITHER DUE TO THE AMOUNT OF SPAM!!! When I say this blog is experiencing SPAM, we are talking 30+ comments PER DAY that are spam! Please understand!! Again, thank you!! Have you checked the books here today yet? This is not a paid ad to me, just one of my favorite publishers I list! Get your KINDLE DAILY DEALS here! Every February! I'M SOOOO EXCITED FOR THIS DAY! I'M CELEBRATING "STIFF PERSON SYNDROME!" Please come back in February to celebrate with me! Maybe YOU have a rare disease? MORE INFO TO COME! 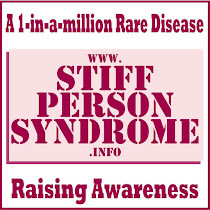 Bringing AWARENESS to Stiff Person Syndrome - a 1 in a MILLION disease! This is my life! "RARE, BUT STRONGER TOGETHER!" RARE DISEASE DAY this every February! Come join us! Help and Join US in the FIGHT AGAINST these RARE DISEASES that take OVER our lives and RULE them with NO CURES! Help on ANY DAY OF THE YEAR! We NEED "YOU!" Even if it's only a $5 tax deductible amount, it helps! We are NOT thought of because so few people suffer from these, so money is NOT allocated to these battles we fight daily, all day. Thank "YOU" SO VERY MUCH!! Click on the photo! read 0 books toward her goal of 65 books. Link-up HERE each week for ALL things bookish! This is strictly a Book Blog and is NOT an income-producing blog - it's my obsession with books! 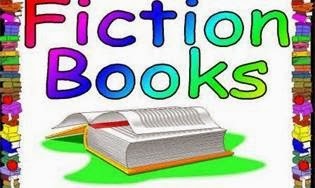 I want to clarify this blog is a BOOK BLOG and only advertizes books! It does NOT advertize ANY products of ANY type, nor do I earn ANY income from this blog. This blog is done out of the pure LOVE I have for BOOKS! A blog is a healthy creative outlet for anyone! I am Totally and Permanently Disabled (I am unable to work for an employer) due to a very rare neurological muscle disease I have called Stiff Person Syndrome, and this is one of the very FEW things I 'am' able to do 'when' I can, on my time, my terms! This blog is for everyone who enjoys books, to enjoy them! Be careful, though, because I've found I have a BOOK OBSESSION! LOL! With that being said, I do ask you do NOT advertize your products on this blog. They WILL BE DELETED! I think this IS ONLY FAIR. If you want to learn MORE 'About Me', please click that TAB up above! I write HONEST "opinions" on ALL the books I read. I am NOT persuaded in ANY way as to 'how' I should rate a book. This is "my" rating system. These are 'my opinions', and 'mine alone' and IN the genres I like to read. 5 - Stars! - MASTERPIECE! BRAVO! Brilliant! TRULY the BEST OF THE BEST! Outstanding! Amazing! Divine! Excellent! CONGRATULATIONS TO THE AUTHOR! This is a MUST-READ, CAN'T PUT IT DOWN! 4.5 Stars! - Just short of being a Masterpiece! Wow! Excellent! GREAT! SUPERB! SO Good! Must-Read! Don't miss this! Just short of a masterpiece! 4 - Stars! - GREAT book! Excellent! Superb! Must-read! A DON'T MISS! You'll be talking about this one! Guaranteed! 3.5 Stars! - Enjoyable! It's better than average. It's NOT mediocre, and if it were polished up a bit more it 'could' be a 4! 3 - Stars! - It's okay. Medium. Average-50-50. Pleasant. - It's a 'Take it or Leave it" - you'll either like it or you won't. 2 - Stars! - UGH! I tried. This one is YOUR decision but I will most likely never finish it purposely and then I'll toss it out the window! 1-Star! - I was FORCED as a HOSTAGE by gun-point while in a 3rd world country prison! Read the book before the movie! Take the pledge! Click on it! I DON'T BELIEVE IN BANNING "ANY" BOOK! READ A BANNED BOOK TODAY! AND ADD IT IN YOUR REVIEW! So you know and so you CAN blog with integrity, the definition of "Integrity" by the Oxford Dictionary is as follows: "the quality of being honest and having strong moral principles; moral uprightness"
I retain the copyright for ALL the content on this Blog unless otherwise stated. Please do NOT reproduce anything without my written consent. Thank you. Get one for YOUR blog at DisclosurePolicy.org! Follow Me on Pinterest! (laurieisreading) Click below! Visit Laurie Here - Cont Fiction and More - Book Reviews's profile on Pinterest. 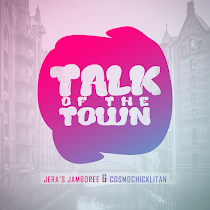 Follow Me/This BLOG the BLOGLOVIN' way! The BEST way to follow ALL your blogs! Instead of GFC, please follow me via Bloglovin' which is "above" OR with GFC below! Follow by Email - then verify in YOUR email box! GOODREADS! Send a FRIEND REQUEST here! Click on the Goodreads PINK HEART! The Literary Blog Hop! NOW to Feb 12th! 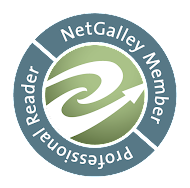 NETGALLEY BADGE - OVER 200 REVIEWS!!! 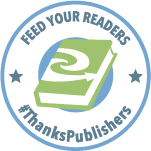 Thanks NetGalley Publishers! LOVE you!!! 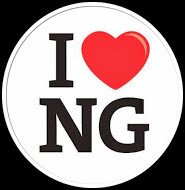 I love, love, love NetGalley! I'm a Co-Hort! 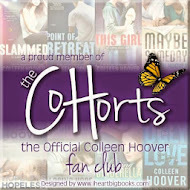 Click photo to go to Colleen Hoover's fan club! Where my Followers are from! Thanks for your support! Over 40? Join here! You'll LOVE it! August 2010. Ethereal theme. Powered by Blogger.